The Airdrie Children’s Festival Society (ACF) is excited to announce the first ever Comedy at the Bert fundraising evening. In partnership with the Airdrie Lion’s Club, ACF is can’t wait to share this evening with Airdrie. ‘One of our main principles of the Children’s Festival is inclusion. To achieve this we need to keep our festival free for everyone to attend. This Comedy at the Bert fundraising event will go a long way to help us achieve that,’ says Pete Lewis, Chair of the Airdrie Children’s Festival Society. 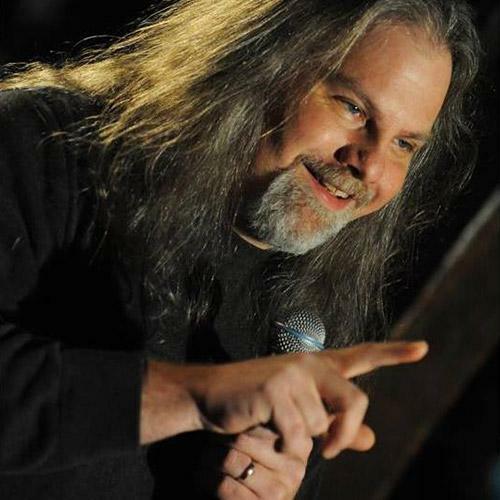 Headlining this event is the hilarious Tim Nutt. Tim is a comic who can’t be judged by his cover, long-haired, bearded and ‘rough around the edges’, audiences expect Nutt’s material to match. But he surprises with razored-down punch lines and well conjured-up premises that place him as one of the top comics working today. He has been to comedy festivals all over the world: Edinburgh Comedy Festival, Montreal’s famous JUST FOR LAUGHS, Halifax’s HA Comedy Festival and The Winnipeg Comedy Festival, just to name a few. ‘I saw Tim Nutt live in Calgary a few years ago and can tell you that you are in for a full night of laughs,’ says Lewis. Airdrie resident Tim Lowing will be the master of ceremonies for the evening as well as the opener for Tim Nutt. Tim Nutt tells jokes, well, more like funny stories with jokes and has been getting away with it for just over 20 years. Tim pushes comedy to explosive new levels and dimensions. He expertly explores the hilarity in everyday life, delighting you with his bizarre concepts and twisted viewpoints, combining one-liners and crafty storytelling. He has had some pretty cool adventures; he’s been to comedy festivals all over the world; Edinburgh Comedy Festival, Montreal’s famous JUST FOR LAUGHS, Halifax’s HA Comedy Festival and The Winnipeg Comedy Festival to name just a few. Often compared to some of his comedy heroes like Billy Connolly and George Carlin, Tim is a consummate Storyteller and Entertainer, weaving his unique point of view into a great performance that is sure please. ‘With a name like Nutt, it’s hard to imagine a career outside comedy. This longhair’s brain is trained on everyday observations filtered through a layer of laconic spite. Nutt plays against his looks. At 6-foot-2, with shoulder length hair and a beard, Nutt is every inch the rocker. Crowds expect him to tell gags about biker babes and blowing joints but he is much too intelligent and sophisticated. He’s a one-man-war on stupid people, playing on audiences’ preconceptions.” – Andrew Clark, The Toronto Star. Don’t miss your chance to get tickets! Buy now!